I tapped a new keg tonight after cleaning the lines. It's still really foamy, although not as bad as the last keg. This sign amused me on the way to the dentist today. Where did you think great teachers come from? That they spring fully formed from the head of Zeus? Just about everybody who’s an accomplished teacher used to be an ineffective teacher, and as the maker of a documentary about first year teachers, I’m totally confused that you don’t seem to understand this. If you want to talk about great teachers, but don’t have anything to say about the conditions under which teachers become great, you are at a different stadium than where the game is happening. I couldn't agree with that more. Not because I think I'm a great teacher, but because I think I'm still making and learning from my mistakes. He also linked to another criticism of the film where the main complaint was the confusion on what it means to create an environment where learning happens in a classroom. Here's a snarky comic strip on what to do to encourage students to read their textbooks. I agree with the premise (that reading the textbook is important) but I'm not sure I completely agree with the message. So we want to excite a new generation of kids—every generation—about the passion, beauty and joy—the PB&J—of science. Passion, beauty and joy are often forgotten in teaching science. I suppose I'm guilty of it many times, too. Plus, cool acronym! Here's a guide to what seminar speakers are really saying that was recently posted over at Science. I'm really thrilled that the colloquium speakers we get in our department are usually really good and interesting to listen to. A well-known astronomy textbook author (and his wife? Not sure.) had a jokey letter to the editor published in the New York Times. Thankfully, it was really brief. There's an article in last month's American Journal of Physics that explores what was discussed in over 300 conversations students had while doing clicker questions in an intro astronomy class. I haven't (yet) read that article, but Stephanie Chasteen at The Active Class had a great summary of the article. Makes me think about what I could be doing better with the clickers. And the last link for today comes from the president of the National Council of Teachers of Mathematics who wrote an article with the provocative title: "Endless Algebra - the Deadly Pathway from High School Mathematics to College Mathematics". I thought this was lake effect snow, but then I got home and it was snowing there, too. I went back to attempting the macrophotography project I had tried starting last Thursday. I realized the problem I was having was that I had been trying to figure out how to mount my camera on the micrometer stage, when I should be mounting my subject on the stage. For a first shot, I wanted something simple, with lots of texture and a bit of color. 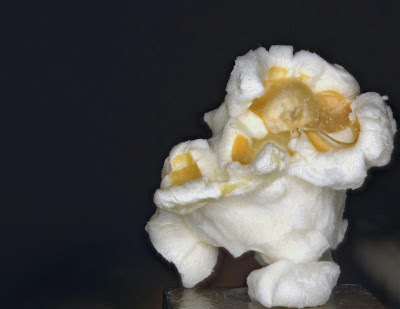 Last night we popped some popcorn to have with a movie, so I grabbed a left-over piece and put it on the stage. 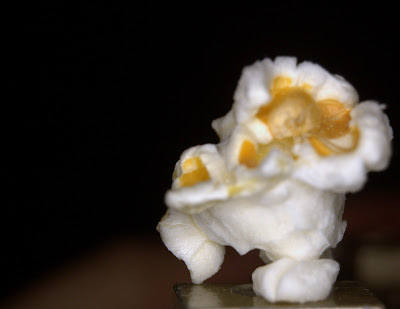 Here's a shot of the popcorn that I got when it first came into focus. Notice that the bottom of the kernel is more in focus than the top. With the stage I can move the kernel by tiny steps and bring it into the focal plane of the camera. The next shot is an image from the middle of the sequence of images that I took. Over all, the focus is better than the first shot, but there are still places on the kernel that aren't quite in focus. I found a piece of software that I'm trying out which aligns and stacks all the images in a sequence to make the entire subject come into focus. I'm pleased with the result for my first try, but I think I overdid the color correction. Something weird happened with the black background which makes it look more grainy and less black. Analysis of the "Big Bang Theory"
When I was in grad school, I used to ask my lawyer and doctor friends and relatives what it was like for them to watch shows like "The Practice" and "ER" because I was fairly sure that no one would ever produce a TV show about physicists. What kills me is not so much that the "Big Bang Theory" exists. I've long gotten over that. It's the in-depth analysis that physicists and physics educators go through to defend or detract from the show. Personally, I just enjoy being wrong about my idea of what could make it on TV. As a physicist, I long ago learned to get used to being wrong. Gedanken experiment: Levitate a physics sitcom? By Steve CorneliussenCould scientists help the cause of science by helping CBS raise its physics situation comedy The Big Bang Theory from the level of Gomer Pyle, USMC to the level of MASH? Might CBS let physicists help elevate BBT from the level of Seinfeld, a hilarious show about nothing, to the level of All in the Family, a hilarious show about society's profoundest issues? During the early Vietnam years, CBS's Gomer Pyle portrayed a cheerful country-boy Marine and his irascible sergeant at a peaceful stateside base. The sitcom ignored Vietnam. Slightly later, CBS's MASH engaged war's horrors, but still provoked laughter, by imagining Marx-brothers-like situations at a ragtag mobile US Army surgical hospital near the Korean War battle front. I was going to try some macro photography tonight, but I couldn't get the camera mounted to the stage with the micrometer travel control on it. I'll have to try fixing that soon. It's pretty sad when this is the best photo I can get of one of the cats.